Kripke’s Paradox Research Papers look at a sample of a paper written on the many interpretations of Kripke's paradox. There are many interpretations of Kripke’s paradox. Some suggest that there is no paradox. Instead, Kripke simply misinterpreted the paradox. Still others suggest that Kripke was mistaken and that there is no paradox. Essentially, Kripke’s paradox involves private language and rules. He suggests that even though there are rules to govern the use of a specific rule or specific word in language, the individual cannot rely on these rules. The rules cannot be changed but there is no absolute guarantee that the next time the rule or word is used, it will be used in accordance with the rules. In a sense, this paradox or notion is an attack on the concept of realism. Here, realism is dealing with the context of the current state of the situation rather than issues and concepts outside of the immediate reality. 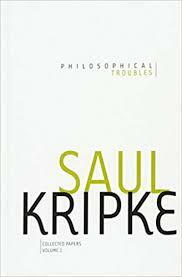 Given the concept of dogmatism, there might be some resolution to this paradox of Kripke’s. In dogmatism, there is little acceptance of doubt as being a valid construct of thinking. In other words, certain reliable and valid information can be obtained. Thus, the concept that knowledge is relative is not legitimate within this framework of philosophical thought. Rules do not change in the dogmatic world. Smply because rules change does not mean that the changing of the rules impact knowledge in anyway. All knowledge is concrete and in the present, so to speak. Thus, in Kripke’s paradox, he suggests that because of the unreliability of the rules, language and the formation of any concepts is impossible. Without rules, all language and concepts are unintelligible. However, this cannot be true. If it were true, then there would be no paradox because it would not exist, since language and concepts cannot exist. This is the paradox about which Kripke discusses. He essentially creates the situation where the reality of the event is nonexistent By possessing knowledge, however, one is indeed suggesting that language and the rules do exist. If they change, then they continue to exist in the events of the here and now. It is the future and the past that do not exist when considering the present. Thus, the only way the Kripke can sustain his paradox is by admitting one aspect. He must conclude that there is no need to state that language does not exist. And this is essentially what Kripke does. Again, he asserts that there is no need for such a fact or rule. This statement is in keeping with the paradox. But regardless of this “fact” of Kripke’s, the basis of possessing knowledge leads to the present. Metaphysics - Metaphysics research papers examine the branch of philosophy that explores the nature of being. Epistemology - Research papers on epistemology discuss the philosophical questions regarding the subject of knowledge. Analytic Philosophy research papers examine the school of thought that emphasizes clarity of argument and the influence of the natural sciences. Paper Masters writes custom research papers on Kripke’s Paradox and look at a sample of a paper written on the many interpretations of Kripke's paradox.